George and I were out exploring again earlier this week. 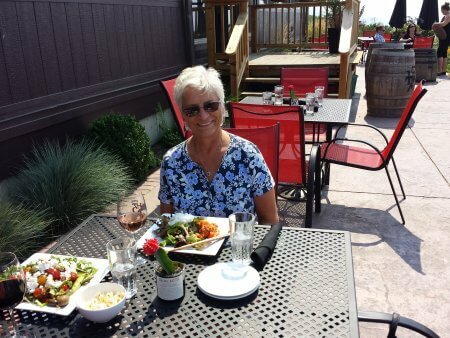 We are ALWAYS on the look-out for wineries we have not previously visited, and new restaurant options for our guests. 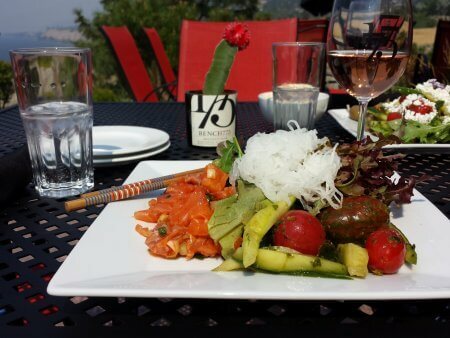 This week we drove over to the Naramata Bench and stopped in at the Bench 1775 Bistro. George did a little tasting of his favorites; red wine. I stuck with sampling only their Rose, which was lovely. But we also tried out their lunch menu and for me, this is always a challenge! I was very pleasantly surprised to find a sashimi salad with line-caught salmon and local fresh salad makings. It was delicious! George tried the Greek Salad and found these teeny tiny little red peppers in his salad! They looked like baby tomatoes but they carried more of a punch – also very delicious. George also had the Malbec which he thought was very tasty! This is definitely a restaurant (& winery!) we would recommend! !